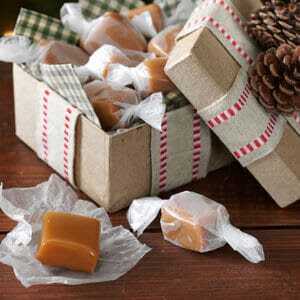 Rich and Buttery Caramels is a recipe from Taste of Home. This year, we will be sharing many holiday recipes we with you. Some of the recipes are from Taste of Home, while some are from friends. Other recipes are traditional family favorites. Recipes that my family makes each and every Christmas. We hope you enjoy all the recipes we share in this month. Happy Baking and Candy Making! My hubby is super crazy about caramels. He loves anything and everything caramel. When I told him I was going to make homemade caramels for Christmas, I seriously thought he was going to cry. This was my first time making caramels, so I wasn’t totally sure what to expect. This recipe was a wonderful first time recipe. Fast and easy plus the recipe only makes an 8 x 8-inch pan. The perfect size, just in case it didn’t turn out! This recipe comes to your from Taste of Home I’ve been a huge Taste of Home fan since they first appeared in the grocery store checkout aisle, some 20+ years ago. I have ALL of the Taste of Home Annual Recipe cookbooks, Quick Cooking Annuals, Light and Tasty Annuals and many more. I’m often asked if I still look at and use my cookbooks? The answer to that question is a big, Yes! Taste of Home is located in Glendale WI. A few ingredients is all that is needed to make these rich and buttery caramels. Melt butter in a 2-quart pan. cook until candy thermometer reads 240 degrees. Remove from heat, pour into a lightly buttered 8 x 8 square pan. Cool, then cut into bite-size squares. Recipe and picture credit: Taste of Home Eagle Brand Sweetened Condensed Milk was used in this recipe. OHHHHH I love caramel!!!! Definitely making these for christmas!! !